The Erasmus + Project “Toward Smart City. 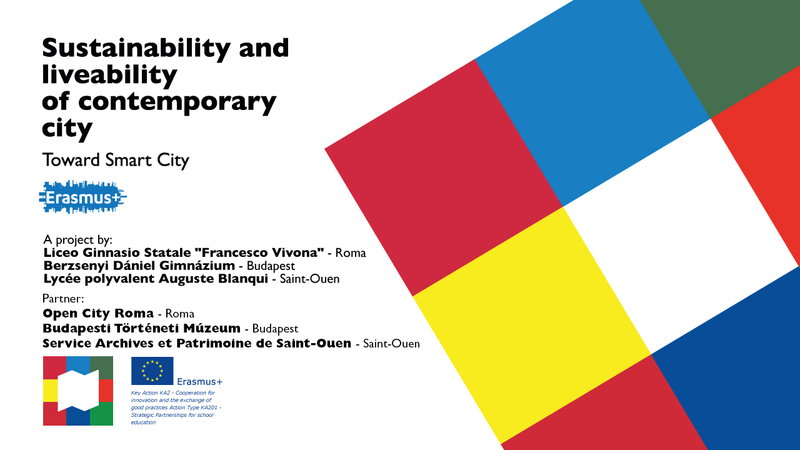 Sustainability and liveability of contemporarycity” is an international and multidisciplinary project that have been funded by European Community and has involved along two years (2015-2017) three european schools: Liceo Ginnasio Statale "Francesco Vivona" – Roma, Berzsenyi Dániel Gimnázium – Budapest, Lycee Polyvalent "Auguste Blanqui" - Saint Ouen .120 students from 15 to 18 age and three institutional partners (a museum, an archive and a no-profit association) around a specific topic with defined objectives and attended outputs. The city is a complex system in which nature, culture, economy and society need to find a new balance between their conflicting aspects in order to look at the future and build a safer and fairer world; technology doesn’t enter in this vision unless it is an useful medium for achieving a goal; the goal is to reach smartness through a winwin strategy that preserves environment, quality of life, beauty, equality and economic weel-being. countries and cultures through international exchanges between the three partner schools. So students can really feel part, maybe for the first time in their life - as they are very young - of the European Community, by experiencing living and studying in a foreign country and comparing teaching methodologies and notions in same fields and around same topics.